Food has become a flashpoint in American culture and politics. In the past generation, Americans have witnessed the introduction of genetically modified crops, the rise of the organic food industry, increasing concerns about obesity, growing awareness to food allergies and other health concerns linked with what people eat, an expanding volume of best-selling books and publications about food and the proliferation of premier chefs as superstars in popular culture. There has been a pronounced shift in Americans’ eating habits over the past 20 years with far-reaching implications for how food is created, prepared and consumed. Moreover, the way Americans eat has become a source of potential social, economic and political friction as people follow personal preferences reflecting their beliefs about how foods connect with their health and ailments, according to a new survey by Pew Research Center. In a way, these choices reflect personalized “ideologies” that shape how people think about and consume food. They are not all-encompassing world views, but they inform key behaviors and attitudes around life’s staples. The new food divides are encapsulated by how people assess the health effects of two kinds of food: organic and genetically modified (GM) foods. The new survey finds that 55% of Americans believe organically grown produce is healthier than conventionally grown varieties, while 41% say there is no difference between organic and conventionally grown produce and 3% say that conventionally grown produce is better. Four-in-ten Americans (40%) say that most (6%) or some (34%) of the foods they eat are organic. Fully three-quarters of these Americans (75%) are convinced that organic foods are healthier than conventionally grown foods. At the same time, there is a sizable minority – 39% – of Americans who consider genetically modified foods worse for a person’s health than other foods. This compares with 48% of adults who say GM foods are no different from non-GM foods and 10% who say GM foods are better for health. The divides over food do not fall along familiar political fault lines. Nor do they strongly tie to other common divisions such as education, income, geography or having minor children. Rather, they tie to individual concerns and philosophies about the relationship between food and well-being. One indicator of such philosophies is the degree of concern people have about the issue of GM foods. The minority of U.S. adults who care deeply about the issue of GM foods (16%) are much more likely than those with less concern about this issue to consider GM foods worse for health (75% vs. 17% of those with no or not too much concern about GM foods); they are also much more likely to consider organic produce healthier: 81% compared with 35% of those with no or not too much concern about GM foods. The second indicator is how focused people are on eating healthy foods. The 18% of Americans who are particularly focused on healthy and nutritious eating are especially likely to consider organic produce healthier than conventionally grown produce. They follow news about GM foods more closely, though their views about the health effects of GM foods are similar to those with less focus on eating healthy and nutritious foods. The people in both of these groups eat and shop differently than other Americans; they pay attention to food-related matters in varying ways; they have different views about food-health issues; and noteworthy shares have food allergies or other health problems with certain foods. Their views of scientists and science research findings are often in sync with others, but people with a deep concern about the issue of GM foods are particularly skeptical of information from food industry leaders about the health effects of GM foods and see more industry influence on science research findings than do other Americans. 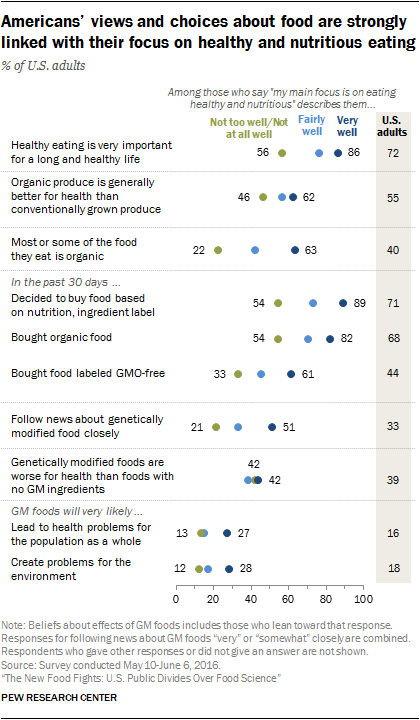 There are also divides by age on views of food issues with younger generations more inclined than older ones to see health benefits in organic produce and health risks in GM foods. But, perhaps surprisingly, women and men tend to hold broadly similar views about organic foods and differences between genders in beliefs about the effects of GM foods are modest. However, women tend to care more deeply about the issue of GM foods than do men, a concern that is quite consequential for people’s views and behaviors about food. Income differences come into play in purchasing behaviors, but there are no differences between people with high and low family incomes in terms of beliefs about the healthfulness of organic or GM foods. These are some of the key findings from a new Pew Research Center survey conducted from May 10 to June 6, 2016, with a nationally representative survey of 1,480 adults. This is the second in a series of reports that details public views on science and scientists in areas that connect with Americans’ daily lives. There are pronounced differences in people’s views about organic and GM foods that tie to their underlying outlook about food. One is the degree of concern people have about the issue of GM foods and another is the degree people are focused on eating healthy and nutritious foods. People who care deeply about the issue of GM foods stand out in their concerns about the healthfulness of these foods and the impact GM crops have on public health and the environment, as well as in their general food buying and eating practices. Similarly, people who are focused on eating healthy and nutritious foods stand apart from other Americans in how strongly they think eating is tied to a long and healthy life and in eating “what they should” most days; in their beliefs about the nutritional value of organic food; and in their attention to nutrition and ingredient labels. 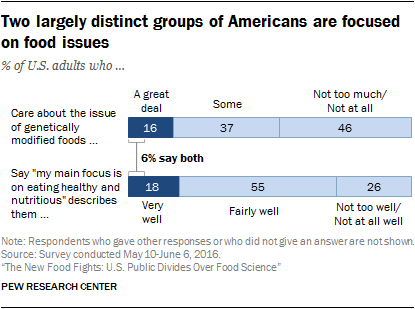 Interestingly, those who are concerned about the issue of GM foods and those who are nutrition focused are largely different groups of Americans: Just 6% of adults both care a great deal about GM food issues and say their own eating style is focused on being healthy and nutritious. But their eating habits, their views about organic foods, their views about GM foods and the importance of foods in health are often at odds with those of other Americans. Fully 81% of those who care a great deal about the issue of GM foods think organic produce is healthier than other conventionally grown foods, compared with 35% of those who are not particularly concerned about the issue of GM foods. Those deeply concerned about the GM foods issue eat more organic foods; 76% say most or some of what they eat is organic. By contrast, fully 75% of those with little concern about the issue of GM foods say they do not eat organic foods or not too much of what they eat is organic. People with deep concern about the issue of GM foods are especially convinced that healthy eating habits lead the way to a long and healthy life; 87% of those who care a great deal about the GM foods issue say healthy eating is very important for a person’s chances of a long and healthy life, compared with 68% among those who do not care about the GM foods issue at all or not too much. More people with deep concern about the issue of GM foods are more likely to follow vegan or vegetarian diets, at least mostly – 21% do, compared with 6% of those who do not care too much or at all about the issue of GM foods. Women are more likely than men to care deeply about the issue of GM foods (20% vs. 12%). But people with deep personal concern about the issue of GM foods are diverse in their races, ethnicities, ages, education and family incomes. There are some modest differences by age, education and income with more of those ages 65 and older, those with lower family incomes (under $30,000 annually) and those with less education (high school degrees or less) saying they do not care at all or not too much about the issue of GM foods. Some 16% of Republicans and the same share of Democrats (16%) say they care a great deal about this issue. 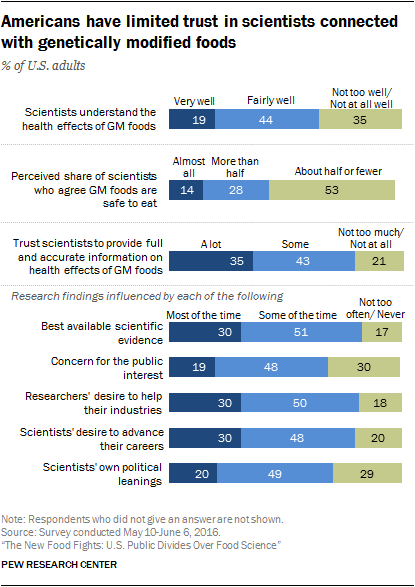 People’s views about scientists connected with GM foods: Americans with deep concern about the issue of GM foods hold mixed views about scientists connected with GM foods. Those deeply concerned about this issue say that scientists understand the health effects of GM foods very well (32%). And, 35% of this group says they trust scientists a lot to provide full and accurate information about the health effects of eating GM foods. But in these areas their views look similar to Americans with less concern about the issue of GM foods. At the same time, this group is more skeptical of food industry leaders and the potential influences from industry interests on scientific research findings. Just 21% of those deeply concerned about the issue of GM foods trust food industry leaders at least some to provide full and accurate information about the effects of GM foods and 79% do not trust information from food industry leaders too much (39%) or at all (40%). 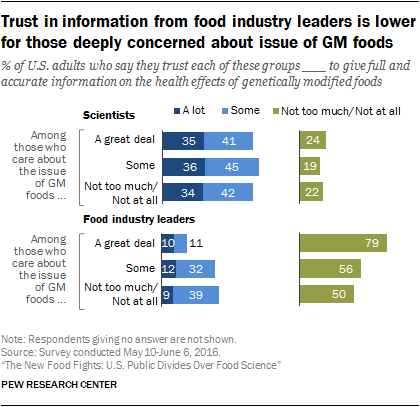 By contrast, 48% of those who do not care about the issue of GM foods at all or not too much say they trust information from food industry leaders at least some. 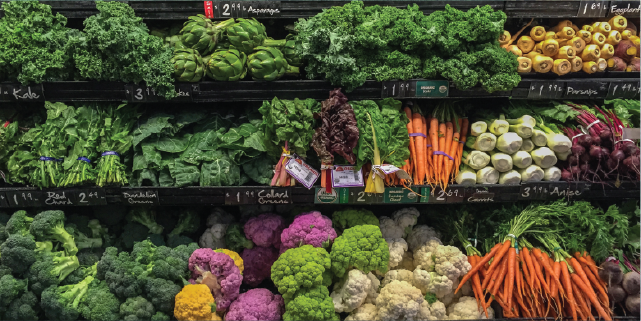 A majority of those focused on eating healthy foods (62%) believe that organic produce is healthier than conventionally grown produce, compared with 46% for whom healthy eating is not a priority. And a similar share (63%) says most or some of what they eat is organic. In contrast, just 22% of those with little focus on eating healthy say at least some of what they eat is organic. People who are focused on eating healthy and nutritious food generally think they reach their goals; seven-in-ten (70%) of this group say they eat about what they should most days, compared to just 13% of those who place little or no priority on healthy eating. Americans focused on healthy and nutritious eating are more likely to follow vegan or vegetarian diets – 22% say they are at least mostly vegan/vegetarian, compared with 3% of those with little or no priority on healthy eating. Those focused on healthy and nutritious eating are also more likely to report they have allergic reactions to food: 26% have at least a mild food allergy, compared with 15% among those with little or no focus on healthy eating. While men and women are about equally likely to say they are focused on healthy and nutritious eating (16% vs. 20%), more men (31%) than women (22%) say that a focus on healthy eating does not describe them too well or at all. Younger adults, ages 18 to 29, are a bit less likely than older age groups to be at least somewhat focused on healthy and nutritious eating. But there are no differences among education, family income or party affiliation groups in terms of the share focused on healthy eating. Americans’ focus on healthy eating and their views about scientists and research on GM foods: People focused on eating healthy and nutritious foods follow news about GM foods more closely than other Americans: 51% follow at least somewhat closely, compared with 21% of those with little or no priority on healthy eating. But, perhaps surprisingly, their views about GM foods are similar to or only modestly different from those with less focus on healthy and nutritious eating. People’s views about scientists and research findings related to GM foods are also only moderately different depending on one’s orientation toward healthy and nutritious eating. To the extent these groups differ in their views, those with a focus on eating healthy and nutritious foods tend be a bit more convinced that scientists understand the health effects of GM foods very well, to trust scientists a lot to provide full and accurate information about GM foods and to see science research findings as rooted in the best available evidence most of the time. The impact of food restrictions and dietary accommodations on social gatherings: While there are wide differences in views and eating behaviors depending on people’s concerns and orientations toward these food issues, it’s not clear how much friction over these issues occurs among friends and family. A minority (31%) of Americans say it bothers them at least some when guests ask for special food options at social gatherings they are hosting. Americans’ feelings about guests’ requests for dietary accommodations are about the same regardless of people’s focus on eating healthy or their concern about GM foods. Fully 54% of Americans say that compared with 20 years ago, people in the U.S. pay more attention to eating healthy foods today. Smaller shares say people pay less attention (26%) or about the same amount of attention (19%) to eating healthy today. Most Americans consider their future health within their grasp – if only they eat and exercise adequately. 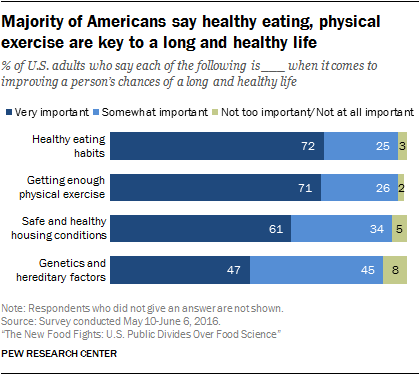 Roughly seven-in-ten adults say that healthy eating habits (72%) and getting enough physical exercise (71%) are very important for improving a person’s chances of living a long and healthy life. Yet people’s behavior does not appear to match that ideal. A 58% majority of Americans says most days they should probably eat healthier, while some 41% say they eat about what they should most days. But among the minority of Americans who are focused on eating healthy and nutritious foods, fully 70% say they eat about what they should most days, compared with just 13% of those with little focus on healthy and nutritious eating. A notable share of those who focus on food issues are people who have struggled with food. About one-in-seven (15%) U.S. adults say they have mild, moderate or severe allergies to one or more foods. Another 17% of adults have intolerances to one or more foods. Food allergies factor into people’s eating philosophies; some 26% of those focused on eating healthy and nutritious food have at least mild food allergies. Some 3% of Americans say they follow a strict vegan or vegetarian diet and another 6% say they are mostly vegan or vegetarian. The share of people eating at least mostly vegan/vegetarian diets is considerably higher among those focused on eating healthy and nutritious foods (22% compared with 3% among those not at all or not too focused on this). Similarly, 21% of those who care a great deal about the issue of GM foods follow diets that are at least mostly vegan or vegetarian, compared with 6% of those who do not care about this issue at all or not too much. Observers have worried that the back and forth of conflicting reports about the health effects of food and drink in the media confuses the public, or worse, fosters distrust in health and nutrition science.2 The new Pew Research Center survey finds that a majority of Americans sense the proliferation of conflicting news but are, on the whole, unfazed. But people with less knowledge about science are closely divided over such studies. Fully two-thirds (66%) of the public says they hear or read news stories about the health effects of what people eat and drink every day (23%) or a few times a week (43%). And many Americans perceive such studies as contradicting prior news reports at least some of the time. 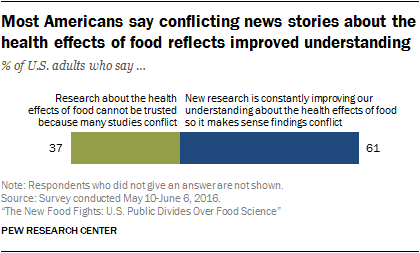 Most Americans say they hear or read news stories about the health effects of foods which conflict with earlier studies some of the time (51%) or all the time (21%). Fully 72% of U.S. adults say even though new studies sometimes conflict with prior findings “the core ideas about how to eat healthy are pretty well understood.” Majorities of those with more and less focus on eating healthy share this viewpoint as do majorities of those with more and less concern about the issue of GM foods. But, here too, people with low science knowledge are closely divided. Half of those with low science knowledge say the core ideas of healthy eating are pretty well understood (50%) and a nearly equal share (47%) say it is difficult to know how to eat healthy due to conflicting information. 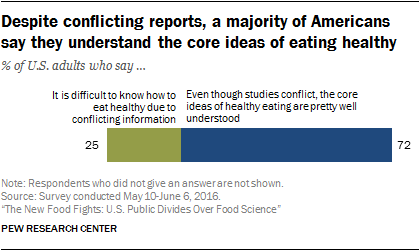 By contrast, just 8% of those with high science knowledge say it is difficult to know how to eat healthy and 92% say the core ideas of healthy eating are pretty well understood. 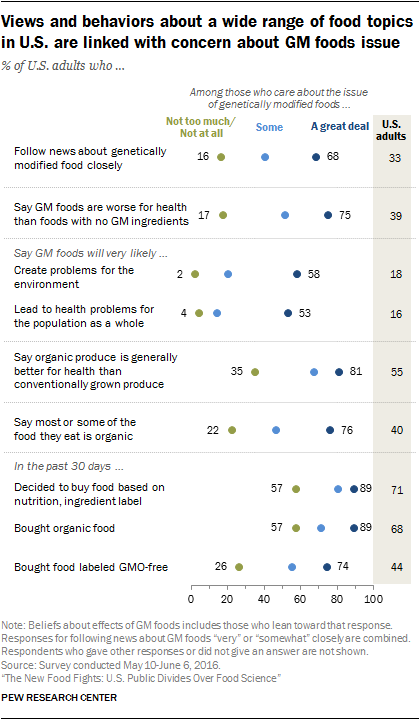 While a 2014 Pew Research Center survey found most Americans (62%) see benefits of scientific advances on the quality of food, in general people’s views of scientists connected with genetically modified foods in this new survey are largely skeptical, or at best, tepid. 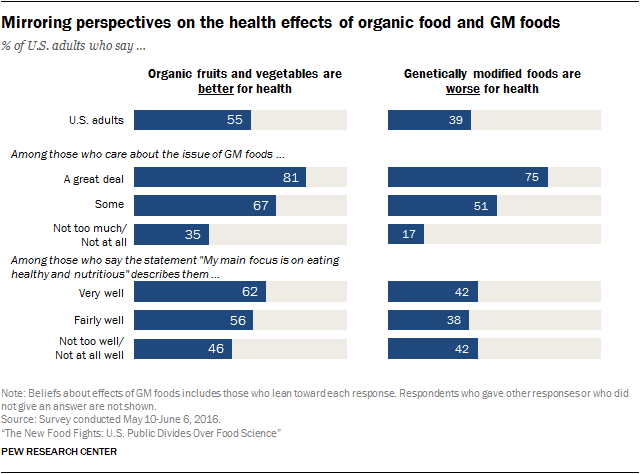 Just two-in-ten (19%) Americans say scientists understand the health effects of GM foods “very well.” Some 44% of Americans say scientists understand this fairly well and 35% say scientists do not understand the health effects of genetic modification at all or not too well. A 2016 report from the National Academies of Sciences, Engineering and Medicine highlighted consensus among scientific experts that GM foods were safe. Most Americans perceive considerable disagreement in the scientific community, however. Only a minority of Americans says that almost all (14%) or more than half (28%) of scientists agree that GM foods are safe to eat. Public trust in information about the health risks and benefits of GM foods from scientists is higher than it is for several other groups: food industry leaders, the news media and elected officials. But only a minority of the public (35%) says they trust scientists a lot to give full and accurate information about the health effects of GM foods, while 43% trust scientists “some.” Trust in information from small farm owners is similar, with 29% saying they trust small farm owners a lot and 49% saying they trust small farm owners some to give full and accurate information on the health effects of GM foods. 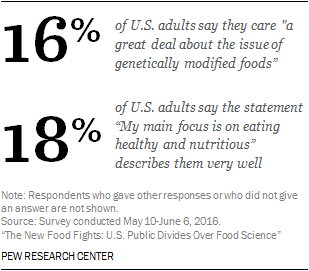 When asked specifically about the factors that might shape scientists’ research on food, people give mixed answers. Three-in-ten (30%) Americans say the best available evidence influences scientists’ research on the effects of GM foods most of the time. About half of the public (51%) says this occurs some of the time, while 17% say this does not occur or not too often occurs. At the same time, three-in-ten Americans (30%) say that scientists’ desire to help connected industries influences the research findings most of the time, half (50%) of Americans say this occurs some of the time. 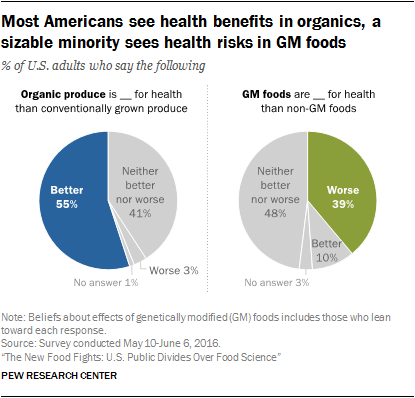 Views among people with a deep concern about the issue of GM foods are largely similar to those of other Americans in their perceptions of scientists’ understanding about genetic modification. However, this group of issue-concerned Americans stands out for its stronger skepticism that research findings about GM foods are influenced by researchers’ desires to help the industries they work with or work for and by their lower trust in information from food industry leaders to give full and accurate information about the effects of GM foods. 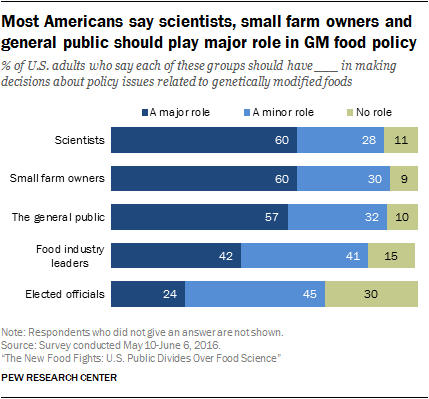 Despite mixed assessments of scientists working on genetic modification, six-in-ten U.S. adults (60%) say scientists should have a major role in policy issues related to GM foods and 28% say they should have a minor role. Similar shares of Americans say that small farm owners and the general public should have a major role in GM food policy. A smaller share of Americans says that food industry leaders (42%) or elected officials (24%) should have a major role in policy decisions about GM foods. People who are deeply concerned about the issue of GM foods give higher priority to the general public in policy decisions about GM foods. Fully 78% among this group say the general public should have a major role in such policy decisions. A smaller majority says scientists should have a major role in GM food policy (66%). People who are not concerned or not too concerned about the issue of GM foods give a comparatively higher priority to scientists in influencing policy decisions. In contrast to public views of climate scientists, people’s views about scientists connected with GM foods are similar across party affiliation and ideology groups. A more important differentiator is knowledge: Americans who have higher levels of science understanding tend to see scientists and their research in a more positive light. Americans with high science knowledge on a nine-item index are more trusting of scientists to give full and accurate information about the health effects of GM foods: 51% of those high in science knowledge trust information from scientists a lot, compared with 38% among those with medium and 18% among those with low science knowledge. Those high in science knowledge are also more inclined than those with low or medium science knowledge to say the best evidence influences research findings about GM foods most of the time. Half (50%) of those with high science knowledge say this occurs most of the time, compared with 30% among those with medium science knowledge and 14% among those with low science knowledge. More people higher in science knowledge perceive consensus among scientists that GM foods are safe to eat. Still, only two-in-ten (20%) of this group rate scientists as understanding very well the health risks and benefits of GM foods. These differences associated with science knowledge are in keeping with findings in the Science and Engineering Indicators and other research showing a modest positive relationship between science knowledge and general views about science and scientists. Science knowledge is not strongly connected with people’s degree of concern about the issue of GM foods or their focus on eating healthy and nutritious foods.